So... this is the De Tomaso Pantera. It’s an Italian sports car built from 1971 to 1991 by a company that at one time owned Maserati. And they liked to use Ford engines. The Pantera used the 351 Cleveland, and later Windsor, engine and mounted it amidships. Consider this the original Mustang realized. Two seat, mid-engined, European. The original Mustang Concept was this. And De Tomaso built what many consider a bit of a Jekyll and Hyde car. It’s beautiful, having been designed by the Italian firm, Ghia. If you took elements of Ferrari, Lamborghini, Lancia and Alfa Romeo, put them all together, you get the Pantera. And yet, the inclusion of a big American V8 into this cocktail is like enjoying a fine wine followed by a double-shot of Tequila. Beautiful and brutal. If you’re unfamiliar with this car, find it on YouTube and have a look and listen. 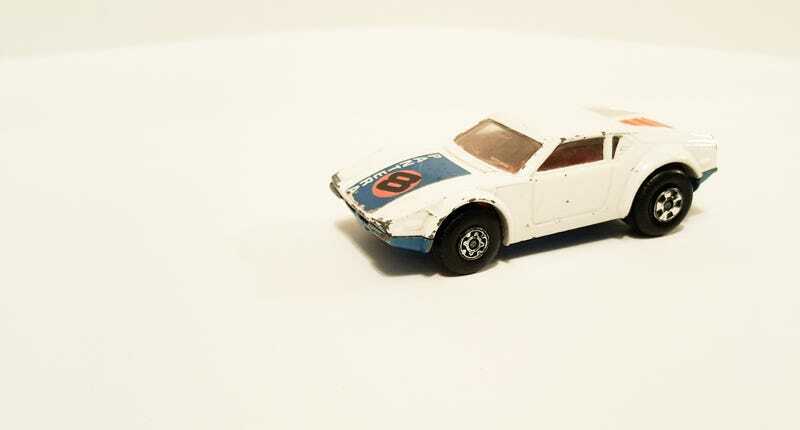 This Matchbox example is not perfect but is in good condition. It’s definitely a nice addition to my collection of fast Fords and Panteras are absolutely one of my favorite sports cars.